California firefighters said Verizon slowed their internet during an emergency. Last summer, during the largest fire in California history, firefighters encountered an unexpected danger. "Verizon is currently throttling [our device] OES 5262 so severely that it's hampering operations for the assigned crew. This is the not the first time we have had this issue. In December of 2017 while deployed to the Prado Mobilization Center supporting a series of large wildfires we had the same device with the same SIM card also throttled," Santa Clara Fire Captain Justin Stockman wrote to his chief, in an email dated June 29, 2018. (Kyle Grillot/Reuters, FILE) Supporters of Net Neutrality protest the FCC's recent decision in Los Angeles, Nov, 28, 2017. "Verizon," Santa Clara Fire Department spokesman Bill Murphy told ABC News, "throttled down speed to below dial-up speeds, and they asked our guys to call customer service to upgrade their plan." The firefighters were forced to use their personal devices as internet hotspots instead. Rich Young, a Verizon spokesperson, told ABC News in an email that "the plan at issue here was permitted under the 2015 rules (and is still permitted today)" and that the company is "working with users to provide them multiple options to best fit their needs." "We've long been committed to an open internet and we stand by that pledge," Young wrote. "And we're equally committed to providing reliable services to public safety users, especially during times of emergency." The issue of manipulating internet speeds for different companies, users, platforms or clients is at the heart of a federal appeals court hearing in Washington later today. 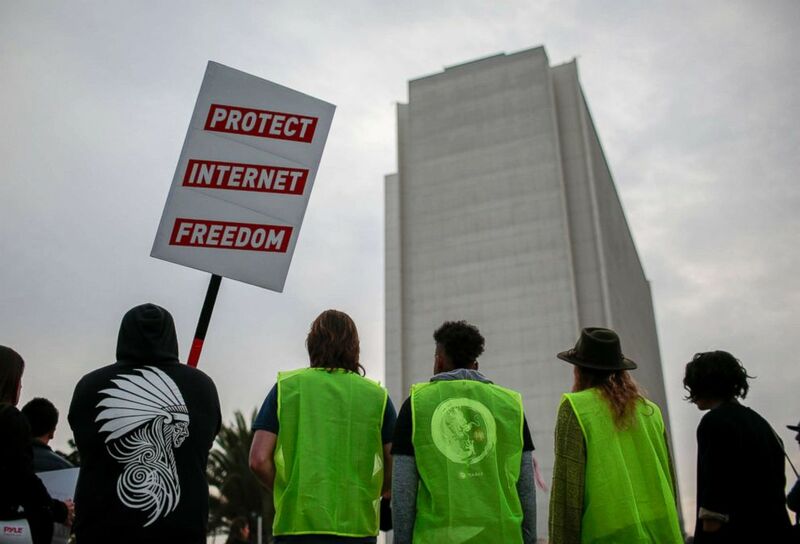 Dozens of defenders of net neutrality, who are pushing for all data to be treated equally, include Santa Clara County and its emergency responders. Led by Mozilla, which created the Firefox web browser, these entities are suing the Federal Communications Commission to return regulation of the internet to Obama-era rules. Joined by consumer rights groups, companies including Etsy and Vimeo, and nearly two dozen state governments -- New York, California, Maryland among them -- Mozilla is hoping the U.S. Court of Appeals for the District of Columbia Circuit will overturn the FCC's 2017 ruling that allows broadband internet service providers far more leeway in controlling internet speeds. "Mozilla filed this lawsuit because fighting for a free, open and competitive internet is part of our DNA," the company's chief operating officer, Denelle Dixon, told reporters. "Net neutrality is still an essential consumer protection that everyone online deserves, and this case is the fight to save it. We are confident that the FCC's repeal lacks legal and factual support, and we look forward to having our case heard in court." Reversing net neutrality was a big win for providers like Comcast, Verizon and AT&T, and a blow to tech firms like Facebook, Amazon and Google's parent company, Alphabet. When the FCC repealed the 2015 rules "it failed to consider the public safety issues," James Williams, a lawyer for Santa Clara County, told ABC News. "Our first responders need to communicate in real time without throttling, without blocking, without paid prioritization, with citizens to give them emergency notifications and receive situational updates."